Our previous stop was Seattle, Washington. We love Seattle. My oldest would live there if he could afford it, but he can’t, so we settle for visiting as often as we can. 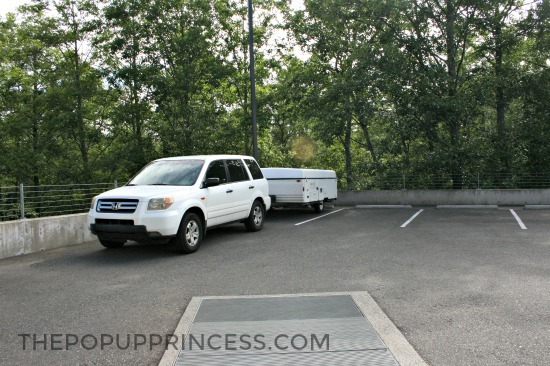 If you read about our Seattle stop, you know one thing we didn’t love was the campground. The sites were so close, and the facilities needed a lot of work. In fact, we were so miserable at Vasa Park, we decided to skip out a day early and get on the road to our next destination. But because we didn’t have a campsite reserved, we cheated and hit a hotel in Bellingham, WA. Now let me explain. I know it is technically cheating when you hit a hotel on a camping road trip, but… when you have three teenagers in tow, sometimes you gotta know when to compromise. 😉 We’ve taken the camper to hotels a couple times, and the trick is to call the hotel ahead of time and make sure they have parking space for our car and our camper. Most hotels we’ve visited have been more than happy to accommodate us. In this case, we stayed at Springhill Suites in Bellingham, and they were amazing. Most importantly, this hotel stay allowed us to get on the road early without a lot of hassle. We didn’t have much time in Vancouver, so it was important for us to make the most of our stay. Crossing the border into Canada proved to be much simpler than we expected. I had all our passports in hand, and the wait was under 15 minutes. We were asked a few simple questions (and we had to throw out our brand new container of strawberries), but then we were across the border and on our way. 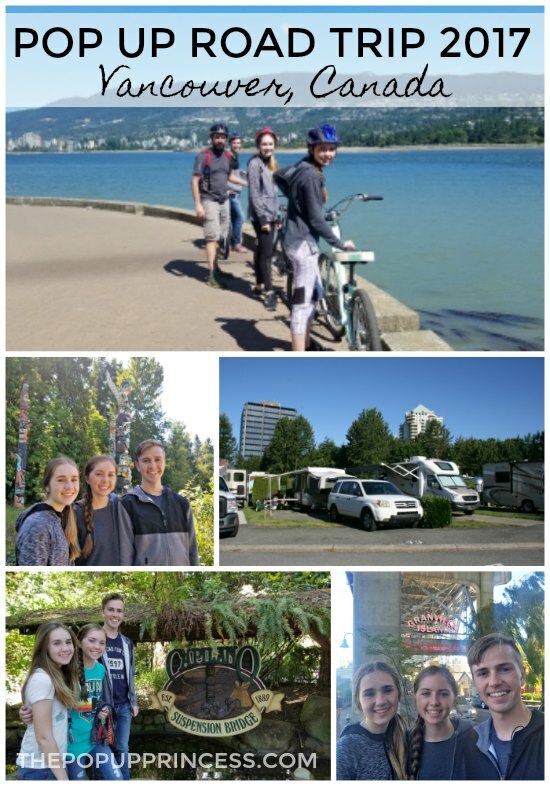 We arrived in Vancouver a little earlier than expected, so we headed to Capilano Suspension Bridge Park to play for a few hours before checking in to our campground. As a side note, when we arrived at the Capilano Suspension Bridge, there was NO parking that would accommodate our car with the camper in tow. They only have a handful of RV parking spots and a couple places to park along the neighboring streets, and those fill up quickly. We had to call the RV resort and see if we could check in early so we could drop of the camper and come back. Luckily for us, they had space, and we dropped off the camper, ate some lunch, and headed back to the park. Full disclosure: This park is pricey. It cost us approximately $143 USD (with parking fees) to visit. That is an expensive experience for us. 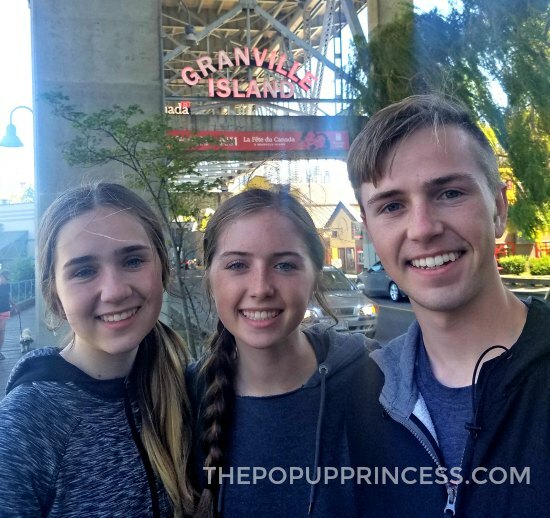 The kids loved it, and I felt like it was an experience we’d regret missing–when are we going to be in Vancouver again?–so I paid it. I had some serious buyer’s remorse about it, though. 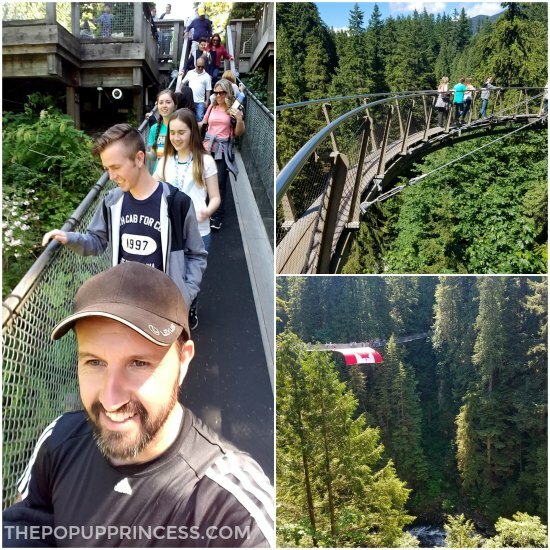 We paid more to visit Capilano Suspension Bridge Park for a few hours than we paid to camp for two days at our RV resort. Like everything here, they were pricey, but they were pretty good. Seating can be scarce–even on a weekday afternoon the park was busy–but if you can find a spot to sit, the view is worth it. 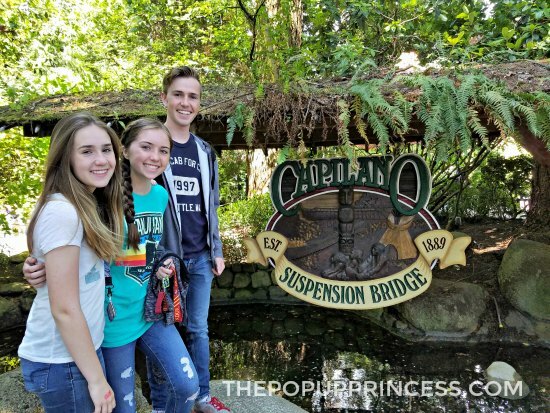 We spent a few hours at Capilano Suspension Bridge Park, and definitely enjoyed our time there. If you are on a budget when you are visiting, however, I would recommend skipping this attraction, as Vancouver has so much more to offer. If you’ve got the money, though, it is a great place to spend a few hours. 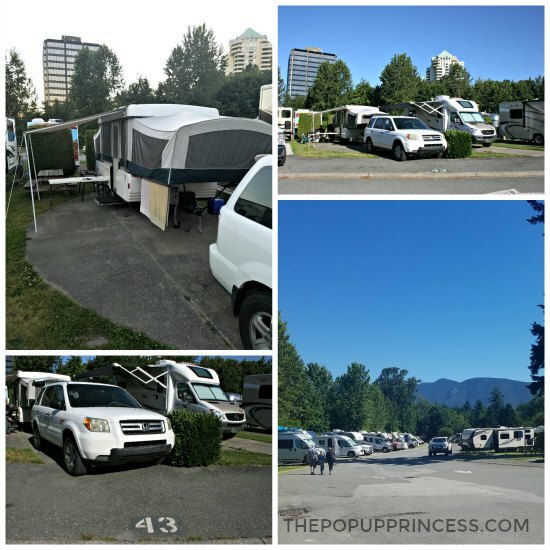 We called Capilano River RV Park home for the two days we visited Vancouver. It was definitely crowded, and the sites are hardly spacious, but we were actually very comfortable here. We didn’t spend much time in the campground, anyway, and this RV park was close to everything we wanted to see. It cost us $131 USD for two nights in a site with full hookups, clean bathrooms and showers with lots of warm water, a heated pool, WIFI, laundry facilities, and a dump station. Although the park was crowded, it was very quiet and we never had any issues with noisy neighbors. Our kids can fight with their siblings like the best of them, so I did feel like I was shushing them quite a bit in order not to disturb our close neighbors. Despite the tight quarters, we still had enough room to stretch out and prepare meals. It was really convenient to have WIFI and laundry on site, too. There were plenty of machines, and we never had to wait. After over a week on the road, we really utilized those laundry facilities–but make sure you change money ahead of time, because the machines take Canadian money only. There isn’t a place to exchange money onsite, and honestly, the older ladies that work in the front office were grouchy every time we asked for something, so we avoided them as much as possible. 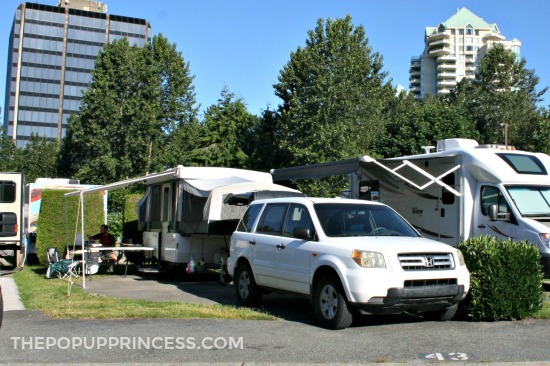 The RV resort was only about 10 minutes away from Stanley Park, which was why we were initially attracted to it. When I was in the planning stages of this vacation, I had come across a picture of Stanley Park, and it was gorgeous. I knew it was a “must see” attraction for us, and the majority of our second day was spent here. 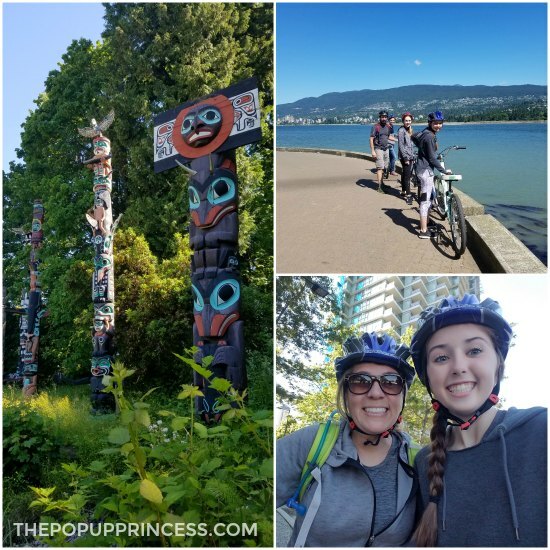 We hit to Stanley Park first thing in the morning, paid for parking, and began to explore. First on the agenda? Biking the seawall at Stanley Park. Several friends had raved about biking the seawall, so we hit up YELP to find a good bike rental place. 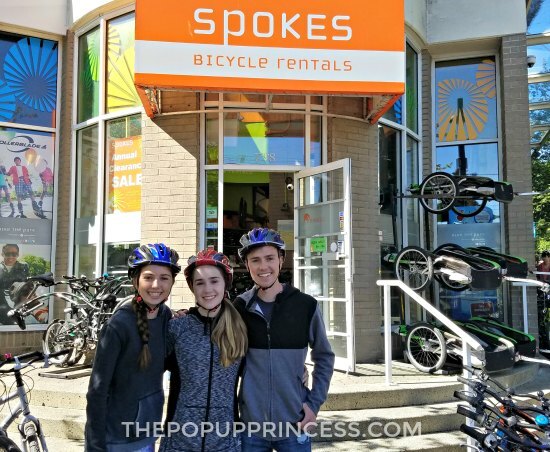 There are several great options, but Spokes happened to be close to our parking garage, so we went with them. They were super friendly and helpful. I’m not a strong biker, so I was a bit nervous, but they put all my fears to ease. 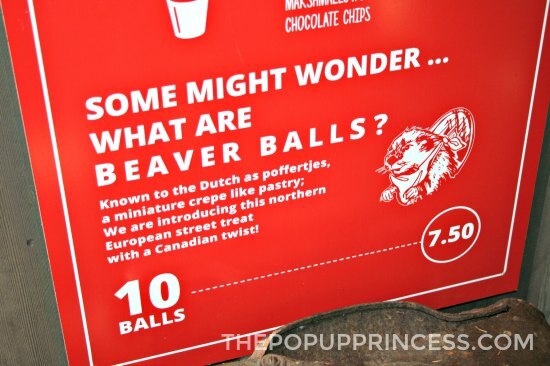 This was by far our favorite part of our visit to Vancouver. For just under $80 USD, we were able to see all of Stanley Park in a really cool way and take our time doing it. Biking allowed us to stop as much or as little as we wanted, and since the bike rental came with a lock, we could pause and see the sights without worrying about our rides being stolen. It took us about two hours to bike to seawall, and it was the best money we spent in Vancouver. After we turned in our bikes, we set off to explore Vancouver on foot. It wasn’t long before we realized it was an incredibly ineffective way to spend our last day in the city. Another camper at the RV park had suggested a bus tour, so we took his advice and hopped on at the next stop we came across. It ended up being a really great way to see the city. We got to see all the different areas of Vancouver (but of course, I forgot to take pictures of most of them) and could hop on and off as we wanted all day long. We ate lunch in Granville Island–watch out for the seagulls–and saw the steam clock in Gastown. Best of all, we learned a lot of history about the city. That made this mama’s heart happy. Helpful Tips for Visiting Vancouver, B.C. 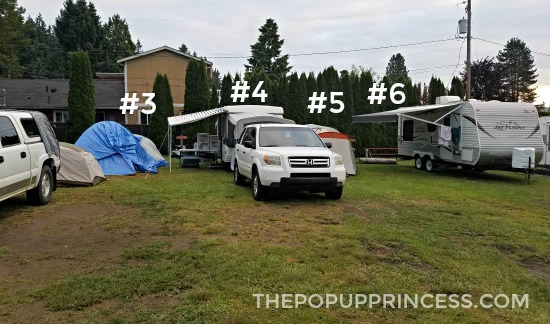 We used Capilano River RV Park as a home base, and were within 20 minutes of everything we wanted to see. The RV park and facilities were all well maintained, and we had everything we needed at our fingertips. They do fill up in the summer, so call early if you are planning to stay there while in Vancouver. No open fires were allowed, but we were able to use our propane to cook. Capilano Suspension Bridge Park is usually on the list of sights to see in Vancouver, but we really feel this was overpriced. If you are on a tight budget, we suggest you skip it in favor of a bus tour or a trip to the Vancouver Aquarium. Stanley Park is a must-see attraction. Definitely plan on bringing or renting bikes to explore the seawall, as you can stop and visit several landmarks along the route. The Vancouver Aquarium is also located in Stanley Park. We didn’t visit on this trip, but we hear it is a worth the money. Consider a bus tour if you are short on time–or even if you aren’t. We were able to see everything we wanted to see in Vancover, and we could hop on and off as needed to explore different areas. Best of all, it was affordable and we didn’t have to worry about parking our car–which is a big plus on Granville Island. Vancouver is an expensive city, but I really felt like we were able to do and see a lot on our tight budget. I know that this stop on the trip was only possible because we didn’t have to pay for a hotel and pricey restaurant meals. 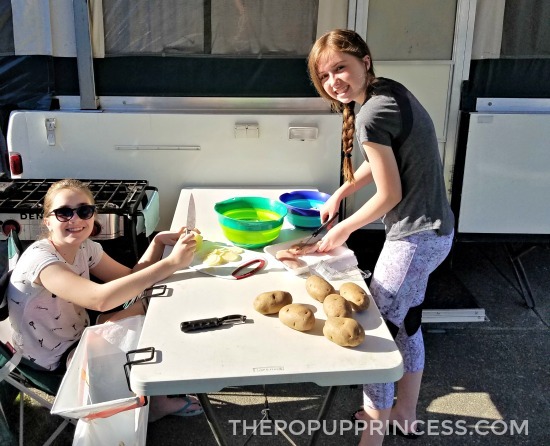 Even though it wasn’t exactly our idea of destination camping, this little pop up camper once again made visiting a major city affordable and fun for our family. As our kids are getting older, I know we only have a few more years of family road trips, and I am so glad we put Vancouver on the list. Awesome, My sister live right next door to this rv park. We tented there one weekend when all the hotels were booked up. If you ever come back its worth it to drive to Horseshoe Bay and take the ferry to Langdale. Our local Provincial park is one of the best I have ever stayed at, Its called the Porpoise Bay Provincial park in Sechelt Bc. Looked like a fun time. I live in Richmond so i have had the chance to frequent all the good stuff Vancouver has to offer. Be sure to make a trip up to Whistler next time if you can. It has a lot of sights along the way to check out and is a nice drive. Thank you for sharing your family’s travels in your pup. I always enjoy reading about your adventures and watching your kids grow up. Like you, our son is a senior and we are ending the years of family road trips in our pop up camper. I am going to have to check out that park with the suspension bridge on line as a possible future destination for us. Good to know that visiting parks in Canada are very expensive. happy camping to you too! 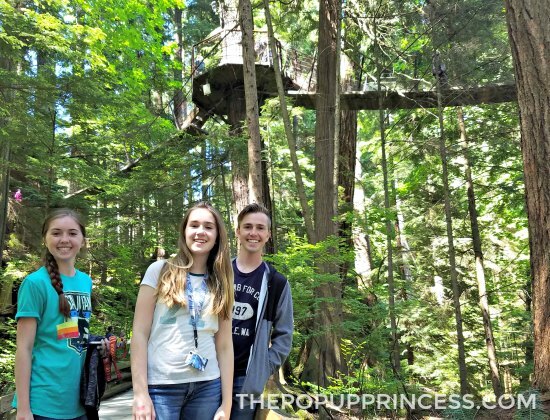 Next time you visit, skip Capilano Suspension Bridge, and go for the less touristy Lynn Canyon Suspension Bridge instead – almost as remarkable, and it’s free! Vancouver is indeed an expensive city, but there are ways around it if you can get a local to show you the ropes. Sounds like you accomplished and saw a whole bunch in just a couple of short days, well done Mamma! So wonderful that you and your sweet family enjoyed yourselves, hope you’re able to come back! 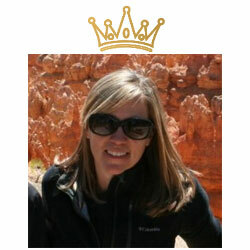 I ADORE your blog, thank you for sharing all that you do!! Going to Vancouver in less than 3 weeks. We fly into Seattle and then we will drive across the border. I’m so excited! I will definitely visit the aquarium with my girls. Do you remember what the bus company was called? We’re going to BC in a few weeks and have never been and that sounds great! Did it look like a trolley?